Seventeen people, including five children, have been killed by a suicide bomb attack on a housing complex in the Saudi capital, Riyadh, according to the latest interior ministry figures. Among the dead are Saudis, Sudanese and Egyptians, Saudi officials said. More than 100 people, among them 36 children, were injured at the compound, mainly home to foreign Arab workers. Saudi Interior Minister Prince Nayef vowed to "get the perpetrators no matter how long it takes" and urged them to "stop or surrender". Saudi officials said the attack bore the hallmarks of al-Qaeda, which carried out a similar strike in May, but it is not clear why the compound was hit. 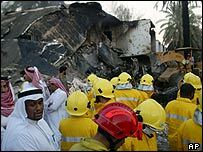 The explosion came a day after the United States shut its diplomatic missions in Saudi Arabia after "credible evidence" of a threat and the UK embassy in Bahrain issued a similar warning. The US warned its embassy staff in the Saudi capital to stay at home on Sunday pending "further assessment of the security situation". Arriving in Riyadh for talks on Sunday, US Deputy Secretary of State, Richard Armitage, said he believed "al-Qaeda terrorists" had carried out the attack. "I can't say that last night's attack was the only or the last attack. My view is these al-Qaeda terrorists - and I believe it was al-Qaeda - would prefer to have many such events," Mr Armitage told reporters. The BBC's Middle East correspondent Paul Wood says if the attack was carried out by al-Qaeda the question is whether it was a failed effort to kill Westerners or simply an attempt to cause instability in the kingdom. International condemnation of the attack was swift, and Arab countries in particular expressed shock that it took place during the Muslim holy month of Ramadan. 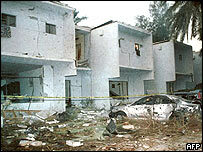 The blast hit the Muhaya compound shortly after midnight (2100 GMT on Saturday), setting off fires that burned until morning. An interior ministry official, quoted by the state news agency SPA, said 11 people had died and 122 were injured. Most of the injuries are light but 25 people remained in hospital on Sunday. 8 Nov: US diplomatic missions closed amid "terrorist threat"
One American is wounded and another not accounted for, according to a US official. The nationalities of all those killed is not clear, although the Lebanese authorities said some of their nationals were among the dead. 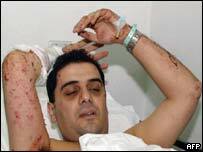 Saudi security sources said the attackers got in by posing as guards and used a vehicle which looked like a police car. The Muhaya compound, which has about 200 houses, is located around two kilometres from palaces belonging to many members of the Saudi royal family. The complex is also believed to have previously housed Western employees of the Boeing aircraft corporation. The BBC's Heba Saleh, reporting from the region, says those who authorised the attack may have been aiming to provoke an exodus of foreign workers who are vital for the Saudi economy. Security at compounds housing Americans and European has been greatly increased since the May attacks. Saudi police in Mecca recently uncovered a suspected al-Qaeda cell believed to be planning attacks. "Most of the dead were Arabs"